NameRobot has now been around for over eight years, and has undergone plenty of changes in that time. However, technology never stands still, so it's now time for a completely new concept! Awards Partners User comments Our Team NameRobot FAQ Why NameRobot? The NameRobot business naming tools are available via different plans: From no-cost free and temporary access all the way to professional memberships. Just choose what suits your situation and your wallet best. Fill out our questionnaire and receive original and unique name suggestions: your new business or product waiting. You still need a complling name? Then make use of the FlyingNames Naming Service! Name checking, easier than ever before: Find out whether your name idea is suitable for professional use. Simply enter your desired business or brand name. NameScore comprehensively checks it for usability. Upon request we can provide you with multiple accounts, development of individual solutions, application programming interfaces to existing NameRobot tools and other offers. Contact us; together we'll find a solution for you. With Namefruits' Name Report, you'll get an incredibly convenient decision-making tool to help you select the most suitable name for your business. Search NameRobot for topics which are relevant to your naming project – with our intelligent tagging system. Experienced naming pros develop first-rate naming proposals. Select your rate, complete a questionnaire, and the FlyingNames team will get to work. The intelligent name finding assistant will provide you with step-by-step guidance and help you find a great name for your business. Utterly simple and simply clever. Find your favorite name generators and specify the kind of name suggestions you want. Refine all settings to reflect your tastes precisely. Search Engine Check - How widespread is the name online? With the Search Engine Check you can find out how many results your name idea yields on several search engines. Is your name already widespread? With search engine results, the rule is: less is more. Because the more often your name is found, the more often it is used by other people. Obviously, you don't want that. While Google is undoubtedly the most important search engine, we also included other important portals like Yahoo and Bing, and also some platforms which offer an extensive search function, like Amazon and eBay. 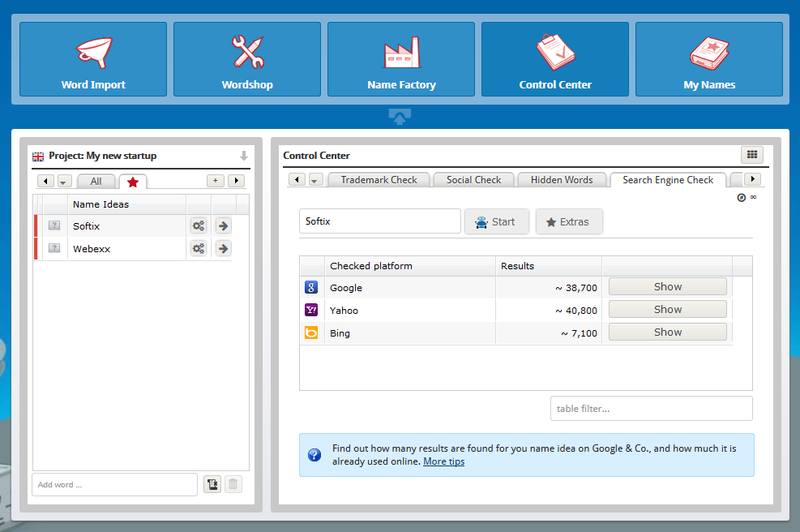 Check the number of results for your name in various search engines with one click. Go to the Search Engine Check in the Control Center right now to test it out! If you don't have a NameRobot account yet, simply register and start looking for a name! Note: The names and logos used above are not affiliated with our company and belong to the brands.